Toilet lights are another bathroom light alternative. As funny as it may seem to install bathroom toilet seat lights, they are actually helpful features. If you share a home with an elderly person or small children, a well-placed light makes a big difference. Most bathrooms don't have an outlet directly next to the toilet. Even if you do have a night light to help illuminate the bathroom, there still might not be enough light cast in the area around the toilet. But lighting the whole room may wake a sleeping partner. A lid-activated light focuses attention right where it needs to be, making it easier to complete the task. Studies have shown that children in the process of toilet training have less nighttime accidents if they feel secure going to the bathroom at night. Since they're often too small to reach the general light switch, a toilet seat light adds to their confidence that they'll be able to do things correctly, and reduces their fear of the dark. As we age, we often lose our sense of space perception. Even if the bathroom is fully lit, some seniors experience accidents because of slips, or have difficulty sitting on the toilet. A seat light brightens the area more effectively. However, let's not kid ourselves. Bathroom toilet seat lights are one bathroom accessory that can also help end the challenging "seat up, seat down" debate in the household, once and for all! Unfortunately, you won't find lighted toilet seats in stock at just any home improvement store, but online, there are many options. The Johnny Light provides a soft green glow from a device that fits just under the lid. Usually retails for $16.99. You can also find Jonny Glow Strips for about $12 that can be used in any bowl. If you're in the process of remodeling, consider a bidet with a light option. Many homeowners prefer bidets to regular toilets because of the focus on personal hygiene. A light is a standard feature of many bidets, including the Kohler C3-200, which sells for roughly $1,200. 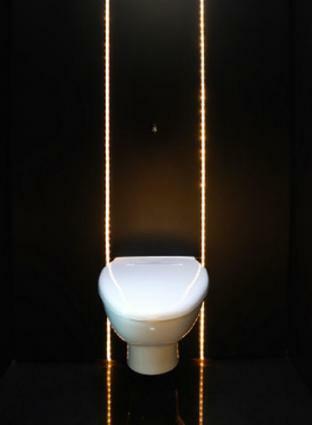 Obviously, your taste will dictate if some of these bathroom toilet seat lights fit your décor. But, if you don't mind a bit of whimsy, or you're decorating a children's bathroom, some of these light styles are fun. The battery-operated Kohler Cachet lighted, elongated toilet seat emits a blue light around the seat and lid. It retails for approximately $45. The Kiss Company in Europe manufactures the Galactika LED toilet seat in many out-of-this-world color combinations. Averages $250. LovetoKnow Home Improvement has many other ideas for remodeling a bathroom. If you'd like more specific bathroom safety remodeling tips, visit University of Missouri's Extension Office for helpful installation advice and diagrams.